Lone Pohutukawa tree flowering (Metrosideros excelsa). New Zealand Christmas Tree, an iconic Kiwi summer symbol. 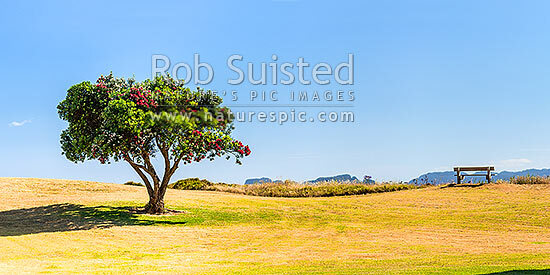 Panorama, Coromandel, Thames-Coromandel District, Waikato Region, New Zealand (NZ), stock photo.